To get away from the crowds while sailing during the height of summer in Croatia, head to the tranquil beach of Divna, one of the most scenic beaches in Dalmatia. Divna Beach has a wonderful tropical feel. The pebble/gravel beach, distinguished by its mesmerising mix of emerald greens and sky blues, lies between towering cliffs covered with green shrubbery and trees, which adds to its exotic appeal. Found on the island of Peljesac, Divna, which means “wonderful” or “beautiful” in Croatian is a place that you cannot miss while sailing from Split or Dubrovnik. There are relatively few accommodations on this part of the island and you won’t find any shops or facilities, so Divna is one of the best beaches in Dalmatia to immerse yourself in Croatia’s striking natural beauty. 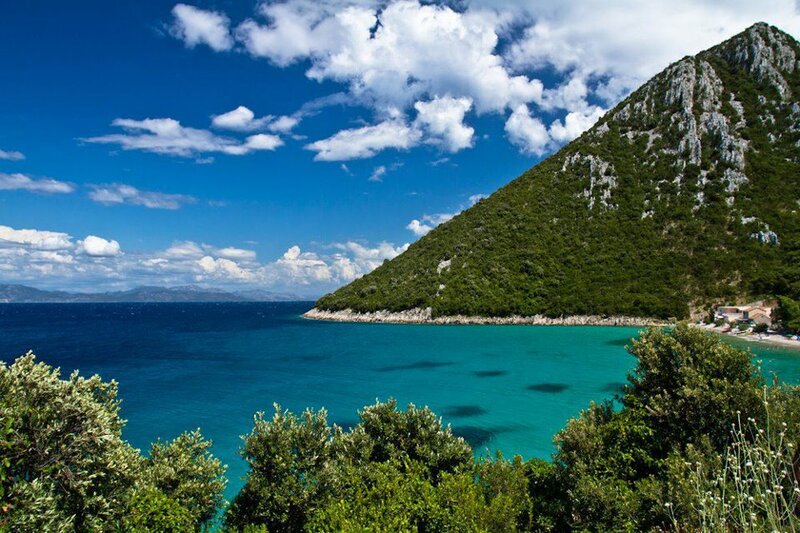 Wine enthusiasts will also want to linger around the island of Peljesac longer. Peljesac is well-known for its wines and you will find many vineyards across the island. Learn more about Peljesac and other great wine-making islands in our Wine Lover’s Guide to Sailing in Croatia. Rent a boat in Split and set sail to Peljesac with up to 6 other guests and pay as little as €1000 for a week-long charter with Zizoo. If you are chartering a yacht in Dubrovnik, one of the first stops you’ll want to make after you leave the marina is Betina Cave. 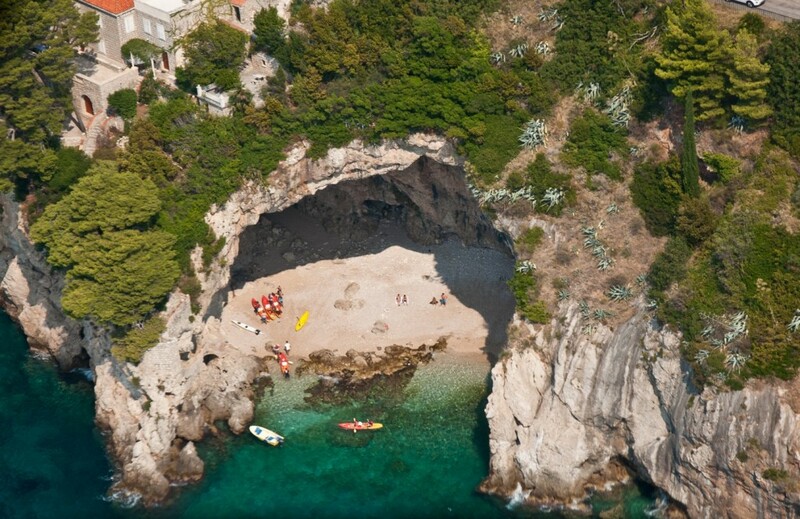 Popular among kayaking groups, Betina Cave can only be reached by sea. This special beach is ideal for those who have rented a motor or speed boat in Dubrovnik, but if you’ve opted for a sailing yacht or catamaran holiday in Croatia, we suggest you drop anchor in one of the beaches nearby Betina and take your dinghy or onboard kayak to visit one of the most beautiful treasures on the Dalmatian Coast. Along the way from Dubrovnik, you’ll pass the curious Villa Sheherezade, a unique architectural gem that graces the coast. Known as the “Taj Mahal of Dubrovnik”, Villa Sheherezada was built as a private residence in the late 1920’s. Since its conversion as a “residence for the wealthy”, Villa Sheherezada has hosted Elizabeth Taylor and Richard Burton. The villa boasts an incredible view of the Adriatic and makes for a picture-perfect spot while cruising the Dalmatian Coast. 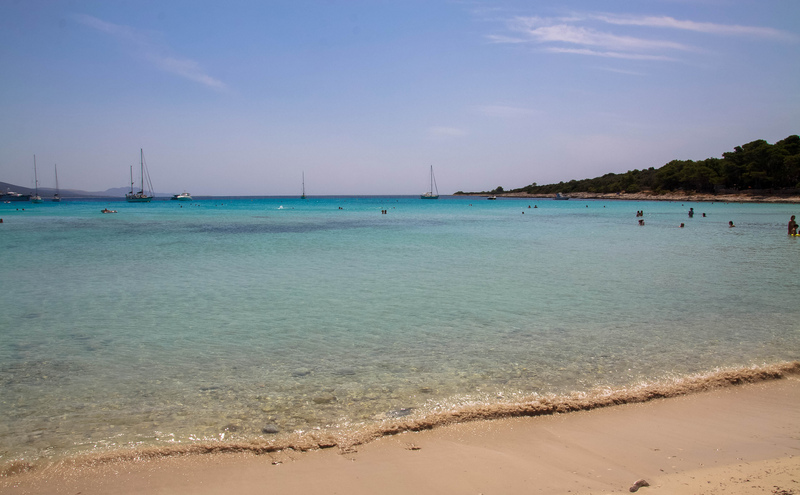 Located in Northern Dalmatia on the island of Dugi Otok (“Long Island”), the picturesque beach of Saharun is an ideal spot for family sailing holidays. The island of Dugi Otok itself is popular among yachtsmen and a fantastic stop for sailors coming from Zadar or Biograd na Moru. The calm, crystal clear waters, white sand and pebble beach and breathtaking view of the sea from the shore also make it one of the most photographed beaches in Croatia. The pine forest that borders the beach also provides a place to cool off during mid-day when the warm Mediterranean sun shines brightly. Find out where to drop anchor for the night at Dugi Otok with our 7-day sailing itinerary from Biograd na Moru. 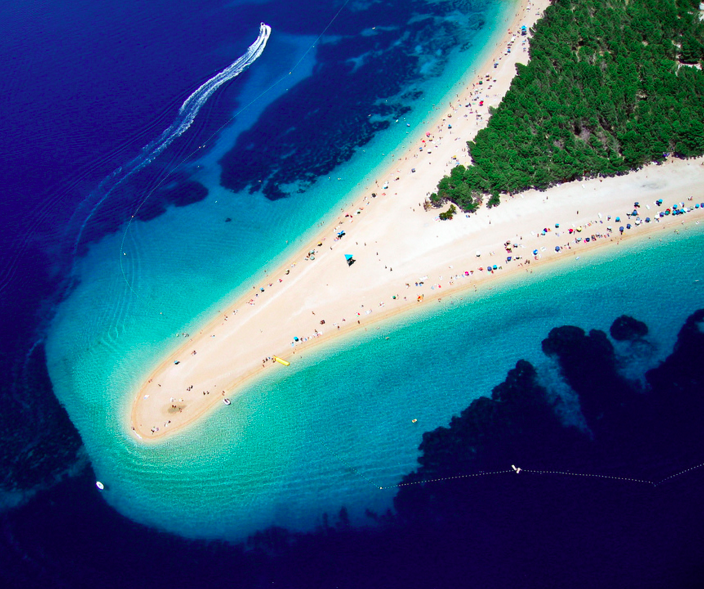 Undoubtedly the most famous beach in Croatia, Zlatni Rat is one of most sought after beach spots in Dalmatia. The vibrantly blue waters and powdery white sand of Zlatni Rat are a magnet for beach lovers of all kinds. For party people, the surrounding area of Bol offers plenty of bars and clubs to keep you up and dancing until the early morning hours. Families will also love this beach and can enjoy many kid-friendly facilities such as an inflatable waterpark, trampolines and paddle boards. And for those sailors who are on a romantic boat holiday in Croatia, we recommend a stop-over in Zlatni Rat and then a trip to the calmer, shaded beach of in Lovrecina Bay. Find the best boats for couples here. 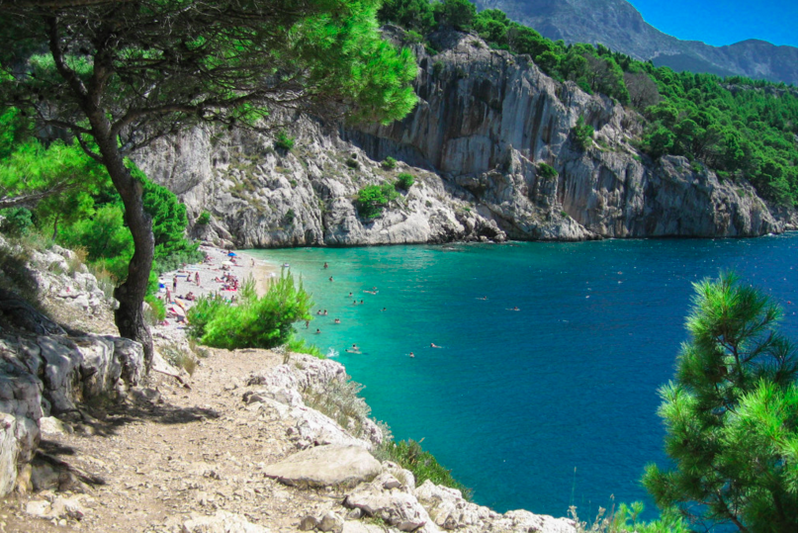 Another popular area to explore for yacht charter holidays from Split is the alluring Makarska Riviera. 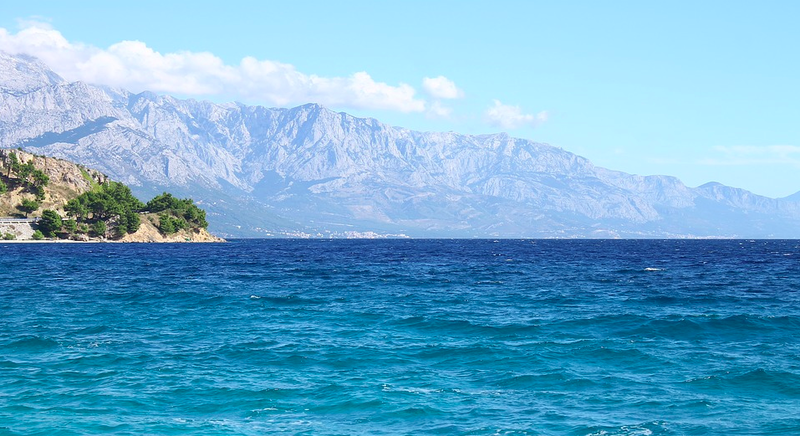 Characterised by its green, forested coast and towering mountains, the Makarska Riviera stretches 60 km and is home to several sandy and pebble stone beaches that are worth spending a day or two while on your sailing holiday in Dalmatia. Lying between lofty mountains, Nugal Beach is one of the most photo-worthy spots on the Dalmatian Coast and the view of Nugal from your yacht is equally as impressive as it is from the shore. The natural setting of Nugal can only be described as majestic. The mountain range that borders the beach is actually home to Croatia’s highest mountain: Mount Biokovo. Nugal Beach is perfect for hot summer days as you can find plenty of shade throughout the day thanks to the forest that you’ll find between the shore and the mountains. Given the beach’s pristine nature and lack of touristic facilities, Nugal has become popular among naturists. So no need to bring your cover up when you come ashore. Looking for more incredible beaches in Croatia? Check out our guide to the 10 Best Beaches here. 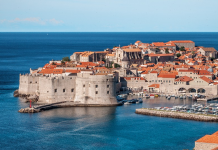 It’s not too late to find great deals in Croatia, but they are going fast. Make sure to check out our latest deals on boats in Croatia and get ready for the best sailing season of sailing yet!